“At the time in the late '90s, early 2000s, they had a really strong program in the country of China,” Mary Beth said. “Maybe some of you in the audience today, you stepped into adoption, you really felt like ‘love is enough,” Mary Beth said. The Chapmans also talked about their charity “Show Hope,” which was founded in 2003 and is based in Franklin, Tennessee, with the goal of providing assistance to adoptive families. 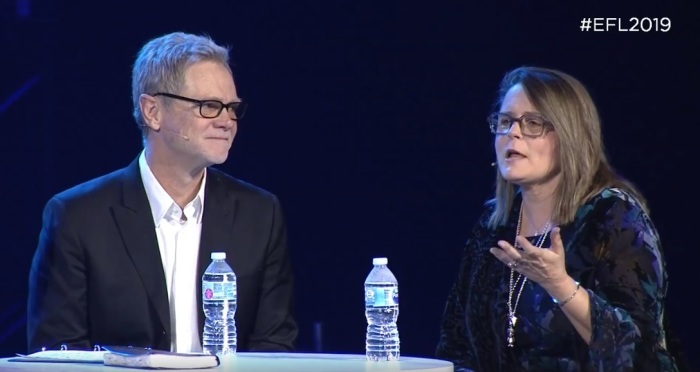 The Chapmans’ remarks came as part of the annual multiday Evangelicals for Life event, which was held at McLean Bible Church’s Vienna, Virginia, campus Jan. 16-18. “The Bible tells us that every human being has dignity and worth. From the tiniest unborn life to the elderly at the end of life, from immigrants and refugees to those trafficked against their will, all life is precious to God,” stated the event’s website. In addition to the Chapmans, other scheduled speakers included: SBC President J.D. Greear; McLean Bible Church Pastor David Platt; Makazi Institute President and co-founder Karen Ellis; former Obama campaign staffer Michael Wear; World Relief’s Advocacy and Policy Vice President Jenny Yang; Anacostia River Church Pastor Thabiti Anyabwile; and ERLC Director of Policy Studies Andrew Walker. The multiday event was being held in conjunction with the annual March for Life, a pro-life demonstration at National Mall that takes place on or around the anniversary of the U.S. Supreme Court ruling Roe v. Wade.